Design elements such as windows, skylights and partitions can have a big influence on the look and feel of an office space, even if mostly on a subliminal level. Almost anything can be changed, but some elements are more malleable than others. Among the more malleable elements is Office furniture, which surely deserves a spot on the list of influencing factors when approaching a redesign. There are a number of reasons why a company might consider a redesign, but central to all of them is one undeniable factor—there’s usually a problem that requires solving. It may be something as simple as wanting to take an outdated design into modern times, but more often than not, there’s a more ambitious objective at hand. A few of the most common motivations behind office redesign are, boosting employee engagement, enhancing company culture, improving employee satisfaction & retention, and promoting innovation. Usually a workspace redesign is one key initiative, working in combination with other initiatives, to achieve the desired outcomes. Office redesigns are ideal for organizations looking to break free from old, outdated surroundings that do little to provide motivation for employees. Modern office design has come a long way since the 1980s and 1990s—even the early 2000s. Today, trends in open office design are gaining in popularity, and the days in which workers operated in cubicle silos are coming to an end. Color schemes are changing, types of office furniture are shifting and modern technologies are influencing the areas in which we work. While all office redesigns are unique to themselves, the general process tends to be similar across the board. Redesign planning begins with a meeting between key decision makers (and sometimes influencers) to discuss what the company is looking to achieve as a result. 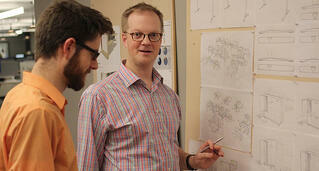 Next, high-level concepts are identified and handed off to a designer or team of designers. Finally, the space is optimized for ergonomic considerations, flow, circulation and more factors, all of which should add up to create a comfortable, inspiring work environment. When it comes to office furniture, the objectives identified in the planning process will dictate the role of furniture in the overall design process. At a minimum, furniture contributes as a key supporting element; in some cases it can be the central driver. Once the overarching design of an office environment has been roughly completed, it’s time for integration of office furniture to be considered. Many people don’t realize that “standard” office furniture is typically available in up to 100 or more sizes and finishes, as well as many other elements that can be customized. This type of customization is essential in commercial environments, which often must meet rigid specifications and cannot be designed around unless the furniture utilized is highly flexible. Furniture can play many roles in an office environment, but it can always be seen as the interface between people and the workspace. Unlike windows, lighting and other peripheral aspects of office design, furniture is something that gets touched and experienced directly. It can be viewed as a layer between the space at large and its human occupants, which can directly influence mood, productivity and outlook. As such, it is important that the furniture style and finishes work hand-in-hand with the building aesthetics and not detract or conflict with the design objective of the overall space. The right office furniture can help to complete the story in any environment, whether it be a space with modern leanings or more traditional appointments. It can provide color and style to an office, which can add balance, depth and personality to help flesh-out the space. 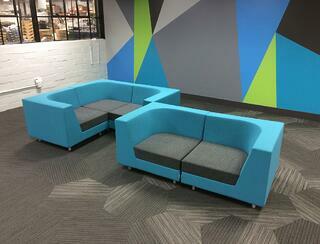 There are certain scenarios in which office furniture will more play more than just a typical support role. Take, for example, a company that wants to transition away from the “cubicle farm” atmosphere they’re currently working in and move towards a more open, collaborative work environment. Once key decision makers have identified this as a prime objective, furniture systems will likely become the focal point of the design process. Some companies may choose to go with benching solutions that resemble the long, open tables of German beer halls, while others may choose modular furniture that can be rearranged on the fly. One of the hallmarks of customizable office furniture is the amount of freedom it provides to everyone working within an office environment. There will always be times when teams need to physically shift around in order to work most efficiently, and rigid office environments outfitted with static furniture can make this very difficult if not completely impossible. 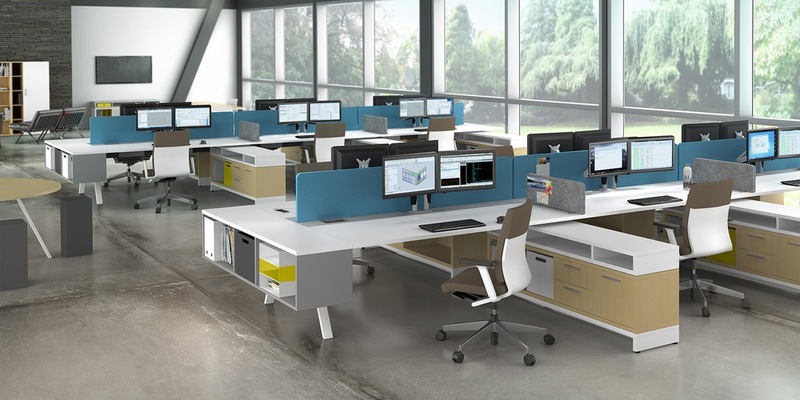 Customizable office furniture takes efficiency issues and other headaches out of the equation, allowing employees and management teams complete control over their environment no matter what challenges the task at hand may bring. Depending on the goals of the initiative, office furniture can be the primary driver of success, or play more of a supporting role in cooperation with broader space design elements. It may be helpful in an office redesign project to use a decision tool, like a weighted scoring tool, or the Kano Model, to help identify and prioritize the most important features. Engaging in this type of strategic planning early in the project will help keep stakeholders focused, hire the right partners, and make better trade-off decisions. Whatever is furniture's specific role, it has the unique function of providing the interface between people and environment, helping to bridge the gap between the human and static elements. It's the one element that people touch and interact with throughout each day. Thus, organizations should focus on a redesign planning process that identifies all the contributing factors, including furniture, and devotes adequate resources to each based on which elements are most critical to reaching the stated goals and objectives.